The mandate of Fisheries & Oceans Canada (DFO) is conservation and protection of Canada’s fishing resources. To support this mandate, regulations are in place to govern the number, size, weight and species of fish recreational anglers may catch. To assist anglers in complying with the law while transporting sport-caught fish, DFO has developed packing recommendations for tidal water species and salmon in freshwater. Part of the exceptional sport fishing experience in British Columbia is enjoying the high quality of salmon and other species of fish. In most cases, residents and visitors will transport their sport-caught fish whole. However, if you prefer not to keep your fish whole, these guidelines will help you to prepare and package your catch to preserve the quality and comply with regulations for sport fishing in B.C. These guidelines should read in conjunction with the British Columbia Tidal Water Sports Fishing Guide/Freshwater Salmon Supplement produced by Fisheries and Oceans Canada and the Freshwater Fishing Regulations Synopsis produced by the British Columbia Ministry of Water, Land and Air Protection. Some of these guidelines do not apply to freshwater species such as trout or steelhead. Enjoy your fishing experience! The British Columbia Sport Fishing Packaging Guidelines are intended for general information purposes only. Where there is a discrepancy between these guidelines and the Fisheries Act and its regulations, the Fisheries Act and the regulations are the final authority. Regulations are subject to change from time to time and it is the responsibility of an individual to be informed of the current regulations. If you have any questions concerning changes to the regulations, contact your nearest Fisheries and Oceans Canada office. 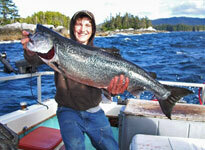 Your catch may be checked and inspected by either federal or provincial authorities. Failure to comply with the Fisheries Act and its regulations may result in prosecution. Enforcement authorities must be able to readily determine the species, number, and if applicable, the size and weight of the fish caught, while in transport or at a location other than your ordinary residence. In addition, as there may by different openings and retention limits for wild and hatchery fish, the distinguishing adipose scar that marks hatchery fish should be kept in tact to allow enforcement officers to identify them. You must have a tidal waters sport fishing licence to harvest fish or shellfish in salt water, including tidal water boundary areas in rivers. In freshwater, you must have a non-tidal angling licence. A salmon conservation stamp is required if you intend to keep salmon caught in either freshwater or tidal water. Before fishing, be aware of the regulations for the area (s) you intend to fish, including the size, daily and possession limits of fish and shellfish. Please read the Sport Fishing Guide/Freshwater Salmon Supplement and check for regulation updates at www.pac.dfo-mpo.gc/recfish, or contact the nearest DFO office for more information. When Fishing, immediately record retained chinook salmon and ling cod (where required) on your tidal waters fishing licence in ink. On your non-tidal angling licencem record all adult chinook retained. Before you package you fish, always ensure the species, number, and if applicable, size and weight of the fish can be easily and readily determined if you are checked by enforcement officers while fishing or transporting your catch. This requirement also applies if you are transporting someone else’s fish. Canning, smoking, salting, or curing your catch is not allowed other than at a person’s ordinary residence and at commercial establishments licenced to process sport-caught fish. The business must supply the angler with appropriate documentation stating the species and the number of fished canned. Canning of non-tidal species other than salmon is not permitted. It is up to the fisher to ensure proper documentation is obtained and kept in the possession of the person who is transporting the fish. When packaging your catch, if a maximum size limit applies, the head and tail must remain attached until you prepare and consume your catch, arrive at your ordinary residence, or deliver your catch to a registered processing facility. • the angler’s name and fishing licence number. The exception to the above requirements is if your salmon or ocean-caught steelhead has a healed scar in place of a missing adipose fin. The clipped fin may indicate the presence of a coded-wire tag used for research purposes and the management of the fishery. In this case, please remove the head of the salmon or steelhead and turn it in to a Salmonid Head Recovery Depot (listed in the Sport Fishing Guide). The healed scar will identify the fish for enforcement officers as a coded-wire tagged fish should they inspect your catch. The fillet must be prepared in such a manner so as to show the removed adipose fin area or healed scar. When steaking a salmon in preparation for transport, do not cut all the way through the fish. Leave the steaks connected by a piece of skin and place waxed paper or plastic film between each steak. Similarly, the tail must remain attached to the body of the fish by a piece of skin. The fish can then be wrapped as a whole fish and later steaks can be removed as required without thawing. For rockfish and lingcod, packaging and labelling is the same as that described for salmon. An individual may fillet the fish in two pieces (as with salmon)/ Skin must remain on each fillet for identification purposes. In those cases where a size limit applies, such as 65 cm (26 in) for lingcod, the fillets, including the tail must meet the minimum “head off” size limit of 53 cm (21 in). Halibut must be filleted in such a way that skin is left on each fillet. Halibut weighing 14 kg (30 lb) or less may be cut into four fillets. The four fillets should be packaged and placed in one bag so that one bag would represent one fish. For halibut between 14 and 34 kg (30 and 75 lb), each fillet may be cut into two pieces. This will result in the fish being cut into a maximum of eight pieces. These pieces should be packaged and numbered in a sequence, e.g., 1 of 8; 2 or 8; 3 of 8, etc. to indicate that eight pieces of halibut represent one fish. Skin must be left on all fillets and pieces, and the packages should be labelled and numbered as described above. REMEMBER: It is your responsibility to ensure the packaging will allow the species, number, size and weight to be easily and readily determined. •the name of angler and fishing licence number; only one name per container. When individuals are transporting or shipping fish, they must package their fish separately and only have one name per package. However, they may share a container. It is recommended that the contents (number of fish, species, and number of packages) be listed on the outside of the container to facilitate inspection. When transporting a recreationally-caught crab, the carapace (shell) must remain attached to the crab until it is consumed or it arrives at a person’s ordinary residence. It is prohibited to have shelled or shucked crab in your pocession, except at your ordinary residence.